This week, Laos, a landlocked country of less than seven million, is presiding over the first of two rounds of regional summitry as this year’s chair of the ten-member Association of Southeast Asian Nations (ASEAN). While all eyes will be on how Vientiane deals with the South China Sea issue just over a week after a landmark ruling on the Philippines’ case against China, it will also be a window into the broader opportunities and challenges that the ASEAN chairmanship presents for the rest of 2016 (See: “ASEAN Can’t Stay Silent on the South China Sea Ruling“). Though only a few meetings will actually get international attention, Laos is hosting a whole series of them this week from July 21-26 at the National Convention Center in Vientiane. These include the ASEAN Foreign Ministers’ Meeting (AMM), the ASEAN Plus Three Foreign Ministers’ Meeting (APT FMM), the East Asia Summit Foreign Ministers Meeting (EAS FMM) and the ASEAN Regional Forum (ARF). As is usually the case in ASEAN chairmanships, a second round of meetings in September will see heads of state attend. As these meetings occur, it is important to keep the bigger picture in mind. Laos – one of the newer members of ASEAN – is holding its annually rotating chairmanship in a critical transition year for the regional grouping. 2016 is an important transition year for ASEAN, lying between the formation of an ASEAN Community in 2015, which we saw in Malaysia, and the commemoration of the organization’s 50th anniversary in 2017, which we will see in the Philippines. Furthermore, this is an especially important year for ASEAN’s relationships with major powers, with the organization hosting three special summits – with the United States, Russia and China – along with having to contend with the much-anticipated South China Sea ruling and its fallout (See: “What the South China Sea Ruling Means“). Laos is also holding the position at an interesting time domestically. In January, the Lao Communist Party, which has ruled the country since 1975, held its quinquennial congress to elect its leaders (as did neighboring Vietnam). Thongloun Sisoulith, who had served as the country’s foreign minister for a decade and is known for his internationalist outlook seeking to diversify the country’s relationships beyond neighboring China, was elected as the country’s new prime minister. 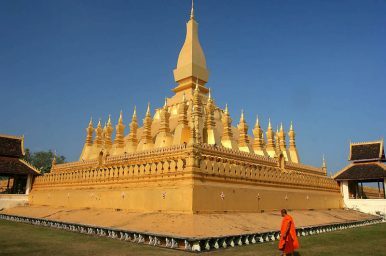 Though his ascension was somewhat simplistically read by some as being a loss for China and a win for the United States (Lao foreign policy, unsurprisingly, is much more complex as with its other ASEAN neighbors), it has witnessed interesting shifts in how Vientiane has managed some aspects of its economic relationship with Beijing. At the same time, the priorities that Lao officials outlined this year also reflect the country’s sense of what it would like to promote in the regional agenda, which is also the prerogative – and, indeed, the privilege – of the chair. To take just one example, the focus on narrowing the development gap and a work plan for the Initiative for ASEAN Integration – an initiative that began in 2000 aimed at accelerating the economic integration of the newer members of ASEAN, namely Cambodia, Laos, Myanmar and Vietnam, or the CLMV countries – directly benefits Vientiane. But the chairmanship also offers Laos some additional benefits beyond the shaping of the regional agenda. It is not often that a small country like Laos gets this much time in the limelight as the chair of an organization which comprises more than 600 million people and is collectively the world’s seventh largest economy. The publicity of this round of meetings as well as the one in September provides an opportunity for the country to enhance its reputation on the world stage. That is not just symbolic. By convening these two rounds of regional meetings, Laos is also afforded the opportunity of other interactions on the sidelines as well that can help further its own interests. Though a whole host of bilateral engagements will occur this week and in September, the one that will receive the most press coverage is the expected visit of U.S. President Barack Obama in September. Obama will be the first ever American president to visit Laos, and White House officials have said that the administration views this as an opportunity to boost ties with Vientiane as part of its increased focus on Southeast Asia. Yet Laos’ assumption of the ASEAN chairmanship also poses its share of challenges. Ahead of the official handover of the position from Malaysia to Laos late last year, some argued that Laos’ key challenge in this round of meetings as well as the one in September would be simply managing the logistics inherent in the task. Though Vientiane has chaired ASEAN before, unlike Myanmar when it assumed this responsibility back in 2014, the magnitude of the challenge this time is much greater than it was in 2004. For instance, there are more than twice the number of meetings than there were back then. But it is also true that Vientiane has chaired other meetings more recently, including the 9th Asia-Europe Meeting (ASEM) in 2012. Furthermore, seasoned ASEAN observers know that capacity-building efforts have been underway by Southeast Asian states as well as other actors to assist Laos with its chairmanship. What could be more troubling is Laos’ challenge of managing major powers within ASEAN. To be clear, this problem is not unique to Laos. Though ASEAN’s rising role in the shaping of the regional architecture in recent years – including the rise of the East Asia Summit back in 2005 – has led to an intensifying involvement of major powers, it has also made the liabilities of its institutional features more visible and threatened the grouping’s much-prized centrality. In recent years, that has manifested itself most clearly in the grouping’s struggle to reach consensus on the South China Sea issue, which infamously led to its unprecedented failure to issue a joint communique under Cambodia’s chairmanship in 2012 (See: “ASEAN’s Soul Searching After Phnom Penh“). That said, given tiny, landlocked Laos’ lack of interest in the South China Sea issue and its significant investment in its relationship with neighboring China, the fear among most of Vientiane’s Southeast Asian brethren as well as other concerned actors about a repeat of Phnom Penh is understandable. Lao officials, for their part, insist that in spite of its constraints, Laos has tried its best to ensure that the South China Sea issue does get the attention it deserves, as it did in its chairman’s statement following the ASEAN Foreign Ministers’ Retreat in February. But it is also true that consensus has been progressively harder to achieve in 2016, as evidenced by ASEAN’s failure to adopt an uncharacteristically strong statement in Kunming last month following last-minute reticence by Cambodia and Laos, as I wrote extensively for The Diplomat and elsewhere (See: “What Really Happened at the Special ASEAN-China Kunming Meeting“). The role that Chinese pressure played in that episode, along with Beijing’s additional sensitivity to any statement with reference to the South China Sea following the ruling, has heightened anxieties. Indeed, going into the AMM, there are already clear signs of Beijing’s hand in trying to prevent the issuing of a separate statement by ASEAN on the ruling or even a joint communique with strong language on the South China Sea, despite the fact that the latter (and, arguably, even the former, as I have argued) would constitute par for the course for the grouping rather than something headline-worthy (See: “ASEAN Should Be Ready With Statement on South China Sea Arbitration“). China has also once again been touting the fact that several countries including Laos support its position on the ruling, a fact that Lao officials have subsequently denied. Suffice to say, any Phnom Penh-like breakdown of ASEAN consensus on the South China Sea would be a huge blemish on Laos’ chairmanship. While much of the media attention will likely be on the international front in Vientiane this week, there could also be some scrutiny on the domestic front in Laos for the remainder of its chairmanship. Human rights continue to be an issue, with the case of the disappeared Sombath Somphone proving a rallying cry for activists as well as a point of concern for Western as well as some Asian governments to varying degrees. Those domestic concerns spilled over into the regional domain as well even before Laos assumed the chairmanship, with reports emerging as early as October 2015 that the country would not host the regular meeting of Southeast Asian civil society organizations on the sidelines of the ASEAN summit this year. For the first time in ASEAN’s history, groups will meet not in the host country but in East Timor – which, somewhat ironically, is not yet even a member of ASEAN. Though Lao officials continue to cite many technical and procedural reasons for why this ended up being the case, it is also true that they have hardly bent over backwards to prevent that outcome and are far from displeased by it. Another area of focus is Laos’ role with respect to the management of the Mekong – one of the world’s largest and longest rivers which flows through China and mainland Southeast Asia – which is increasingly in peril in part due to a string of hydropower projects by riparian states. Though other countries are complicit too – most notably Beijing upstream – Laos has placed a significant emphasis on hydropower as it seeks to become the “battery” of Asia. But some of Vientiane’s projects, most notably the Xayaburi Dam in northern Laos and the Don Sahong dam in Champasak province near the Lao-Cambodia border, have come under scrutiny for their negative impacts. When then-secretary of state Hillary Clinton visited Laos back in 2012, she gave the country an earful on this issue. In response to a question from The Diplomat, Ben Rhodes, one of Obama’s closest advisers, did say last week at an event at the U.S.-ASEAN Business Council that the United States would look to address the Mekong as part of its conversations with Laos, though he did not specify exactly what Washington would look to say. As is the case every year, media accounts of Laos’ ASEAN chairmanship are likely to focus on a few key issues, most notably the South China Sea this week. Though that is understandable given the greater attention to these global matters, we should also keep in mind that they are but one small part of the broader challenges and opportunities that the chairmanship presents to Vientiane, as it does to any ASEAN chair each year. Assessing ASEAN’s South China Sea Position in its Post-Ruling StatementIs Laos’ ASEAN Chairmanship a Threat to Southeast Asian Regionalism?A New Cambodia-Laos Border Deal?Laos Dam Collapse Brings Flood of QuestionsWhere Are ASEAN’s Defense Initiatives Under Singapore’s Chairmanship?